Tommy Dunne was always a promising young hurler and winning a North Tipperary Senior medal with Toomevara at 17 years old in 1991 was a sign of the many successes that lay ahead. An excellent county minor career was followed by a quick promotion to the 1993 senior squad, making his championship debut in that year's semi-final. An Under 21 All-Ireland medal followed in 1995, before his senior career went into overdrive with county captaincy, League and All-Ireland medals, All-Star awards, plus a remarkable eight county senior medals to add to his achievements. At this stage he is one of the longest-serving inter-county players around and his perfomance in the 2001 All-Ireland final, in which he was also the winning captain, remains perhaps his career highlight. As Tommy has recently been appointed Tipperary senior captain again, Premierview decided to avail of its hugh corporate mileage allowance, head to Gurtagarry, and shoot the breeze with arguably the greatest stylist in the game of hurling today. We'd like to thank Tommy for his courtesy and patience in giving us his undivided attention for a couple of hours. One of the real perks of this job is getting to meet people like Tommy, and we hope that you find the fruits of our labour interesting and enjoyable. BC An attempt was made earlier this year to effect fundamental changes to the Senior county championship in Tipp, by reducing the amount of senior teams. The argument being that because of easy games for the top teams, weaker teams finding themselves so out of their depth that nobody – strong or weak - benefits. What is the Toomevara perspective on the most beneficial county championship format? TD Well to be honest I don’t know officially what the club’s perspective on it really is. I know that they think that it’s going to be a harder championship to win, from a club point of view, than probably it was previously. We’ll be out in a couple of weeks. We’ve a very tough group with Loughmore, Borrisoleigh and Kilruane. I think we’ve probably got the toughest group in it; and then the North championship being a knockout loser’s group as well. I think it’s going to be a very good championship. Personally, I think it’s probably the right way to go but it remains to be seen. It’s going to be definitely harder to win it than it was before. CR The view of many people in Tipp is that the team is more or less the equals of anybody for pure hurling, but sometimes lacks the intensity of other teams, such as Clare and Kilkenny last year. That sometimes many of our players are too prone to rely on touches, flicks, and what we might call pure hurling, and that this is not enough against teams that can marry these skills with a more physical approach. Do you consider that this is a legitimate comment? TD I would consider it as a fair comment and I think it’s also something that the players and management recognise. I think if you go back in recent years over Tipp’s best performances they generally coincided with Tipp being able to compete physically with teams as well as being able to hurl. We’re lucky that the skills and as you call it the pure hurling element is something that we hope we’ll always have, whereas maybe with other teams they might not consider themselves to be as good at the skills as maybe we are. But definitely the physical aspect of it is probably something that we have to work on harder than most other counties. I’d agree with you there. I think for us to be successful it’s something we have to develop into our game and we’re very much conscious of. BC Have you worked much on the physical side of it much this year or has there been a lot of hurling done? TD Well we have worked on it. We have individual weights programmes and personal training to develop weaknesses in our own physique or in our own make-up that we think is necessary. This year for the first time in a good while, early in the year, we got an opportunity to spend one or two extra nights in the gym. We were only training one night a week collectively as a unit which freed us up to do other types of training which we wouldn’t have been able to do if we were meeting two or three times a week in Thurles. So I think that will benefit us, hopefully it will anyway. BC Is it something you realised after the Kilkenny and Clare games last year that you may have come up short in the physical stakes? Was it a reflection at the time? TD I think we know it’s something we’re conscious of all the time. I don’t think we knew just because of those games. I think for sure particularly in the Clare game we were blown away physically but I think there were other factors to be taken into consideration in that. We completely peaked I think to a certain extent in the League Final shortly before that and I think it would have been impossible to repeat a similar type of performance inside two weeks. That’s my opinion, but I’d agree with you that unless you compete physically with the likes of Clare you generally don’t have a chance. It’s something that we are very much aware of. BC Toomevara has won eight of the last twelve county senior titles, yet has made only a mild impact on the Munster championship. Is that because of the fact that the county championship runs so late in Tipp in many years, creating situations such as Toomevara found themselves in in 2001, or is this statistic simply a fair reflection of the standard of club hurling in Tipp – that it’s just not good enough to produce teams to compete successfully at a higher level? TD I hope that’s not the case, to be honest with you. It’s probably a question that other people might need to answer better than me. We feel that we’re there or thereabouts in terms of competing with the bigger teams. I don’t think we’re quite good enough to win a club championship just at the moment. I think we were a couple of years ago. In terms of 2001 I think the fixtures did work against us that particular year where we played I think six or seven Sundays in succession. I think that definitely was a factor that particular year. But other years fixtures weren’t a factor and we still didn’t win so it’s hard to put your finger on the problem. I think we were beaten in ‘94 by two points with a team that gave as good as they got and probably on a lot of days would have won it. In ‘94 we were beaten in the Munster Final by Killmallock, a good Killmallock team, a game that Toom were hot favourites to win but didn’t play on the day. So I think in years past we were probably better. We had teams that were bigger and stronger and more physical and probably were more suited to winning club championships than we do have at the current time. I think with the make-up of the team it’s difficult for us to win a club championship. That’s not to say that we never will win it. I think it’s got more to do with the nature of our team more so than any other outside factor. BC I felt this year personally that Toomeveara could go all the way. There was very little between yourselves and Newtownshandrum at the end of the day. The game seemed to be slipping away from you in the last few moments. It looked like you had the hurling but the game didn’t go well on the day for various reasons. Were you optimistic this year for any particular reason that you could go all the way? TD I don’t think we were any more optimistic than any other year to be honest. I think maybe we might have got a false sense of security in the county championship particularly in latter stages of it, particularly in the County Final where we hurled very well against Thurles for long periods of time and looked to be cruising and they came back at us. Plus the fact that we carried a few injuries after that going into the Kerry game and we even struggled in the Kerry game. We just weren’t playing as good as we were able in the championship and I think Toom won a championship last year being a long way off their best to be honest with you. Against Newtown we just came up short because we just weren’t good enough on the day. I don’t think we were fit enough to beat them anyway. Everybody knows the type of game Newtown play and it was probably the first big exposure they got against Toom. We weren’t really able to deal with that and it was definitely a bit of a learning experience for us. BC Is it a big ambition for you to win one? TD Well it is even though I think instead of getting closer it might be getting further away. We’ve had a lot of chances to do it an unfortunately we’ve failed so far. We have to wonder about how many more chances we’re going to get. CR It is generally agreed that physical fitness and training has been revolutionised over the past decade, and perhaps it was a process that had already been begun by people like Phil Conway. Obviously it is a momentum that can’t really be rolled back, but do you think it has been beneficial? Is the game the better for it? TD It’s a hard question to answer. I don’t know if the game has become better. In some ways it has and in more ways the fitness aspect of it can be completely over-exaggerated, not only by the media, but there are probably certain counties and certain managers that probably overdo the fitness aspect of it. The question you would have to ask yourself or the thing you would be worried about is fellows at club level pushing the fitness thing on young fellows all the time. At inter-county level you have to have a certain level of fitness, it’s as simple as that, that’s taken for granted. It’s something I think you would be worried about that at underage level in clubs about fellows imposing fitness structures on young lads of 14 and15 and 16 years of age that might be detrimental to them going into the future. CR A lot of older guys would make the point that we don’t see overhead striking or ground hurling or these types of skills any more, and that’s as a result of this emphasis on physical training. BC Have oue gone back to basics in the fitness training since Jim Kielty left. There’s two different methods. Do the two styles vary much, Jim Kielty’s and Ken Hogan’s-Colm Bonners? TD Not a fierce amount. You still have to do your basic gym training in the winter months, but Jim brought in a regime with us that was SAQ, speed, agility, quickness, which was a new dimension to our training. I think that really helped the team at the time and the timing for that was perfect with us because in the previous years Ken had laid down a serious foundation of general fitness for the team when they came on board in ‘99 so I think we had probably got as much out of that type of training as we could and Jim just came at the right time and as a result we had a great year in 2001. We’ve still retained a lot of that SAQ, we still use it in training. Both go hand in hand. I don’t think you can train completely on the SAQ. I don’t think it was ever meant to be like that. It was meant to be something that you could add as part of your training. BC Many people are cynical about the GPA. For example, they spoke on television a few years back about ‘respect for players’, yet when Eamon Corcoran was badly treated last year – and we are talking about the delay in his appeal – the GPA seemed to have had no view on the matter, and only seem to deal with very high-profile issues, or arrange – albeit very worthy - sponsorship deals. It is not seen by many supporters as a body which deals with nitty-gritty player issues. Is that a fair criticism? Or is it making a real difference on the ground? TD To say that the GPA don’t deal with nitty-gritty issues I think is a bit unfair. I’ve been involved with the GPA for a good few years and it has grown. It started off very much on shaky ground and fellows were kind of afraid to be associated with them. Thank God it has grown in stature and I think it does make a difference. If you ask players in weaker counties particularly if the GPA is making a difference to them I think they would say that it has; for instance the mileage rate. We’re lucky in Tipperary anyway for a start in that we generally don’t have many player welfare issues and never have had in my time anyway. Really where the GPA does a lot of its work that goes unnoticed is with the weaker counties and counties that don’t get much exposure, the likes of Tyrone hurlers or Mayo hurlers, these type of guys. Everybody knows about the big sponsorship deals that they’ve done with Club Energise and the Carphone Warehouse, Central Mortgages; all of those are there to benefit players as well. They’re pumping money back into the GPA through these sponsorship deals. In real terms then the mileage rate for players in terms of expenses has gone up about 50% in the past twelve months. The GPA would claim credit for that. Also there’s a standard amount of training gear now that every player gets in every county that was never there before in terms of rain equipment, togs, sock, boots, all of these have to be catered for now by the County Boards at the behest of GPA recommendations. Player welfare has come up at several County Conventions throughout the country. Player welfare is now on the agenda where it never was before. BC Do you think they could have taken a bigger role to interfere in case with the likes of Eamon Corcoran last year, or was that outside their remit? TD Well I don’t know exactly what happened specifically with Eamon’s case. I know that if Eamon had to seek assistance from the GPA or needed assistance from the GPA in whatever shape or form they would have been there to provide it. It would be impossible for me to say what. I know Eamon got huge support from the County Board and the management here and probably felt he didn’t need maybe a controversial voice to that side of the equation. That may or may not have been the case. I wouldn’t be fair for me to comment. The GPA is there for people that do have grievances in whatever shape or form they may be. I think they make a big difference. I think most players would agree that they do. CR In the 1995 and ’96 championships it seems to us that you shipped ferocious criticism from Tipperary supporters as a young player with big expectations. How aware were you of this? And how did if affect you? TD I probably was aware of it at the time. I don’t think there was any major big deal. They were difficult years for Tipp. We weren’t winning that many matches and supporters were very frustrated, so it was a very difficult time. I think the way I look at it now is that it’s in the past; we’ve come out the other side of it. It’s always hard to take criticism, you always go out to do your best and all the rest. But I think you take the criticism the same as you take the credit, and it kind of gives you a balance. I find, especially in recent years, that you generally take things with a grain of salt. I don’t think it’s made too much difference to me to be honest with you. It’s never particularly pleasant but at the same time that’s part and parcel of being an inter-county player. BC Was there ever anything particularly vicious said to you face-to-face at that time? TD Ah, there would have been lots of stuff that wouldn’t have been nice. But it was never something that would keep you awake at night or it was never something that was going to make you stop hurling, but it was just something that would make you more determined. That’s why when we won in 2001 it was such an important year for the likes of myself and the guys that came through those few years that were very bad. 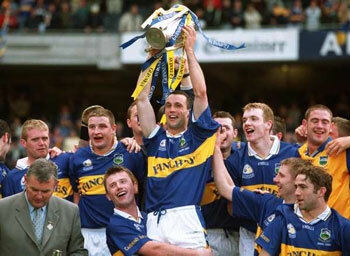 You’d always be wondering whether Tipp were ever going to win a championship with me on the team. That was something that would always wonder about and I’m sure supporters probably wondered the same thing at times. So it was great to actually come through the other side and to prove ourselves able to win an All-Ireland. 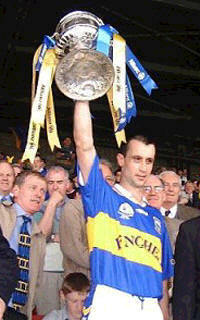 Tommy making victory speech 2001 All Ireland Final. BC Nicky English said to us in a previous interview that the days when Tipp supporters go to a game expecting to win easily, are the days that Tipp are traditionally most vulnerable. We found it a very interesting statement, as it suggested that inter-county players are aware generally of the supporters’ views. How aware of the supporters would a county player in Tipp be? TD I would say that he would be very much aware of them and the supporters are very important to us actually. They have a huge role to play in the interests of the team. I think keeping the supporters happy or keeping the supporters’ faith in the team is very important for the squad. Having said that Tipp supporters are very critical and expect an awful lot from players, and we are very much aware of that. So there is a certain amount of pressure on the team all the time to be putting in good quality performances. Unfortunately that’s not always the case. BC And would you go along with the expectancy part of it, that when Tipp are expected to win a game like the Munster Final against Waterford in 2002, that Babs talked us up on radio. Is it a factor would you believe? Does it get through to players, that expectancy? TD I’d be lying it I said it didn’t. It probably shouldn’t, but the fact of the matter is that you’re always in a real no-win situation when you go into a game where supporters are on a complete high and are expecting something. I think 2002 is the classic example. Tipp gave a good display against Limerick in the semi-final and I think people got carried away, maybe just because it was Waterford. If it had been Cork the supporters may not have been as confident. Certain aspects of the media were giving Waterford no chance, which was ridiculous. It is harder to go into a game when you’re raging hot favourites and your own people are expecting fireworks, I think it is. CR Pairc Ui Chaoimh has become a virtual home from home for Tipp over the last ten years, and many supporters have grown tired of the same venue year in year out. What would be your own favourite grounds? TD I actually like Pairc Ui Chaoimh. I don’t know why. It took me a long time to get to like it. It used to be a graveyard for us for a good few years going down there, but we turned it around then in 1999 and 2000 and 2001 and it’s a place in the summertime when the sun is shining and there’s a full house there’s a great atmosphere. Obviously Semple Stadium is a great venue but unfortunately we don’t get to play any championship matches in it. BC What’s your own favourite ground? TD Ah, Thurles would be. BC The adoption of the new Hurling Development Committee proposals will add a few extra matches to the championship, and possibly get rid of some of the imbalances in the championship previously. However, it now raises the bar for the Munster teams even further. For example, it is quite possible that if the draw fell that way that a Munster team could have to play six top teams to win an All-Ireland. Would you be in favour of this system which retains the provincial structure, or do you think that it is time to abolish the provincial championships altogether? TD I wouldn’t be in favour of abolishing the Munster championship or the provincial championships. I think most players would like to see the Munster championship remain. I definitely would like to see it kept anyway. As for the proposals of the HDC, to tell you the truth I haven’t really looked at them too much. I think it’s a good idea from the aspect of counties getting a certain amount of games in the championship, high quality games that mean something. I think the danger in this is that there could be games where two teams could play and there might be nothing at stake for one of the teams. I think that might be the biggest danger in this new proposal but I haven’t really examined it closely. BC Do you see an imbalance that’s there in the current system between Munster and Leinster? Without naming any particular county, it seems to be an easier path to come out of Leinster and find yourself in an All-Ireland final very quickly compared to coming through Munster. Do you think there is an imbalance there in the current system, now and previously? TD Well I suppose it is a controversial one. The harsh reality of it is in Leinster there are only three teams that are capable of winning a Leinster final, so therefore it seems to be an easier path. I’m not saying it is an easier path but you could pick out any number of examples going back through the years. Kilkenny generally don’t have to play a serious championship game until July, or the same with Wexford and Offaly in most circumstances, certainly the middle of June or the end of June. Whereas if you take the likes of Clare and Waterford this year who are in the shake up for a League Final they have a game to play less than two weeks after the League Final. I think there is an imbalance there. It unfortunate, I mean we found it to our cost last year and in other years as well. It’s hard to avoid it, that’s the provincial championships and there’s a lot to be said for them. The Munster and Leinster championships are great and no-one wants to see them go, but there is an imbalance. CR Michael Doyle was the big casualty of last year. He seems to have taken the blame for last years’ bad performances. Yet the players associated with those matches are still in place. Does this put extra pressure on the Tipp players this year? TD Well there’s pressure on Tipp players in some respects to make up for some of the performances we had last year. I think it’s unfair to say that Michael Doyle takes all the blame. Certainly if you knew the players, that’s not how they feel. The players accept all the responsibility for the results last year, the same way as the players take responsibility for the results and for the performance on any other given day. We’re well aware that the people outside the line can’t make that much difference on the day of a game. This year is very important to us and we’re treating each game very, very seriously and we know that a lot of people were very disappointed with us last year, and we were very disappointed with ourselves for letting that happen. So we’re hoping to get opportunities to rectify it. CR You seem to be keeping it very low key and Ken seems to be playing his cards close to his chest as regards trying out players. Is the championship the real focus this year and is the league less important than it would have been in previous years? TD The championship is number one priority, there’s absolutely no question about that but at the same time in order for us to prepare properly for the championship we have to go at full throttle right up to the championship so whether we win the league in the meantime or not is co-incidental. It may very well happen that we get to a league final and if it does fine, it will be part of the preparation for June 6th. Obviously for us this year, the league final wont be a factor in terms of how close it is to June 6th so it gives us a free run if we can get that far. These matches that we’re playing right now are a huge part of our preparation for the championship. BC Would you be attracted yourself by the prospect of being Tipperary manager in some grade in the future? TD I wouldn’t be attracted in the slightest, no. I wouldn’t be attracted. I think it’s an awful job. CR Can you tell us a bit about the importance of Our Lady’s Templemore and Waterford IT in your own development as a hurler? TD Our Lady’s was very important because it was the first time after primary school that you were hurling at a more adult level and hurling with guys from different clubs which was a completely new thing. The hurling more physical and we played a lot more winter hurling which we wouldn’t have been doing before that. I met some great teachers in there, John Costigan, Jody Spooner, Seamus Bourke, guys who were good hurlers in their own day and gave an awful lot back to the young lads in Templemore and I really enjoy the few years in Templemore. CR And Waterford IT then and the Fitzgibbon? TD Well everybody knows how strong Waterford are now. I think they won the first Fitzgibbon in ‘92, but I went there in ‘94/95 and we won the Fitzgibbon in ‘95, a fairly good team. I was only there for two years. It’s a very strong hurling outfit and their level of professionalism was probably the first time I got to see professionalism working. Their preparation for hurling was a huge aspect of life down there. Their professionalism down there taught me a lot. BC How importantly do you view your role as Tipperary captain? TD It a huge honour, everybody knows that. It’s something I’m very lucky to have. But really at the end of the day it’s not a huge, huge factor. It’s probably a title more than anything else. Personally it’s a huge honour and I know any individual on the panel would be honoured to have it. It’s massive. It’s just great to be in that position and to be able to captain them. After having said all that you still have to put in good performances and earn your place on the team. There’s nothing worse than not hurling well, particularly if you are the captain. So it brings its own pressures. I’ve enjoyed my years doing it and I’ve had a very good run with it, lost a few big games but I’m been very happy with the return I’ve got from being captain. BC Is it something that brings pressures outside of training and games, being a representative for Tipperary, doing commercial activities and promoting Gaelic Games? TD Well it has its responsibilities as well as pressures. There are very high expectations. A lot of people out there would expect certain things because you are in such a position. That’s not always the case. I consider myself not to be the greatest role model in the world even though people might build you up to be that. That’s just an aspect of it that you have to live with. Then when your doing interviews and speaking to people your always might be concerned that you might not say the right thing, or might say the wrong thing at the wrong time and it might upset someone. But that’s part and parcel of it. I getting used to it over the years. I remember when I got it first it was something I was very much scared of, but I’ve grown into it. BC Are you a type of Roy Keane figure on the pitch? TD Oh yeah I’d be a fierce man for giving out (laughs). The lads would probably tell you better than me. I wouldn’t be the easiest to play with or to deal with. CR On your own training as a hurler, did you do a lot of training on your own and what type of skills did you try to develop or did you have any of your own individual training methods? TD Actually funnily enough I never really trained that much on my own when I was younger. I’ve probably done more of it in the last couple of years than I did when I was young. I don’t know whether that says anything about me or not. Definitely fitness has always been a problem for me, even though I never put on weight I always find fitness the hardest aspect of it, especially when I came onto the panel first I found trying to develop a level of fitness for inter-county hurling a huge problem and it took me a long time to adjust to it. Even still to this I day struggle with fitness and I find training difficult during the winter months. I look forward to the summer much more than the winter, as most fellas do. But definitely the fitness aspect of it would always have been a bit if a struggle for myself. The last number of years the gym work had added a new dimension to training for me since 1999. BC Do you do weights as well? TD Yeah, that’s what I mean, gym and weights coincide, but it’s difficult to maintain that during the summer. BC Are you given diet plans? BC What do you make of the Tipp support generally? David Kennedy made appeals in 2001 for more support for the Wexford replay. Would you have been of the same sentiment? , When things are good for Tipp things are brilliant, like the All-Ireland homecoming in 2001, but when things are bad the knives are out. TD There is a huge buzz and we definitely get that. The Tipp support for us is massive. When we go to Pairc Ui Chaoimh and see the atmosphere that the Tipp supporters are able to create there, it’s absolutely magnificent for us. It’s very much part of our make up. The supporters are crucial to the humour of the players. We realise that the knives are out when things aren’t going well and we accept that, that’s just part of it. I’d agree with you that the flair they bring and the buzz they bring is unique. Hopefully there’s still more of it to come.